Multi Company purchase order management software track and process sales and purchase transactions details of your company. PO software is useful for small to large sized business organizations to process and maintain customer, vendor, stock item transaction records and other invoicing details. Purchase order organizer software is useful for business managers, invoicing staff and accountants to manage entire purchase order process and prepare different financial reports for analyzing overall business growth. Keep track of business sale and purchase order records. Sales/purchase transactions, reduce error and save time. 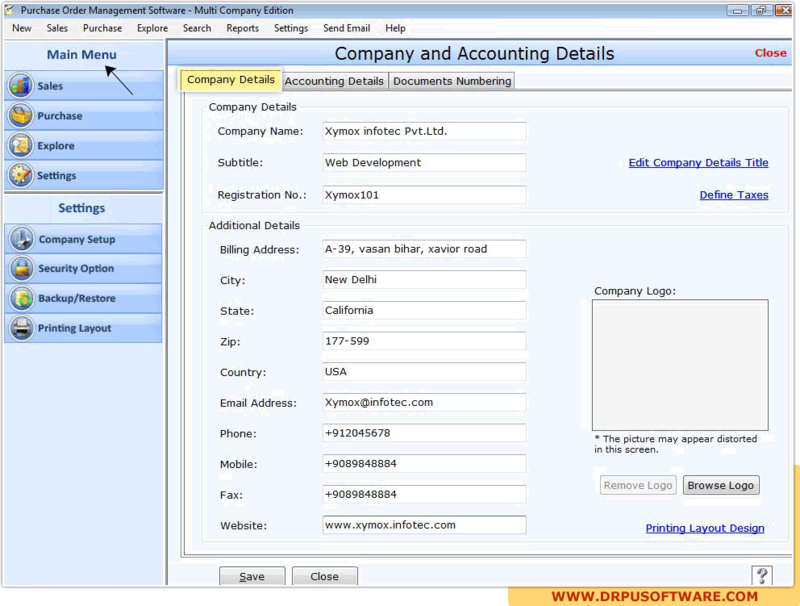 Manage sales and purchase records of multiple companies: Software easily manages business sales and purchase records in well organized way. Generates reports and provides option to send these reports via email: Software prepares sales and purchase reports including quote, delivery, receipt, deposit, invoice and item transactions report to view entire business revenue. Provides advanced search option: Program provides advanced search option to search required sales and purchase records. Password protected feature: Software provides password settings that restricts from unauthorized users to access or modify accounting data base records. Data backup and restoration feature: Software purchase order provides data backup and restore facility that helps user to keep data safe in major data loss situations.